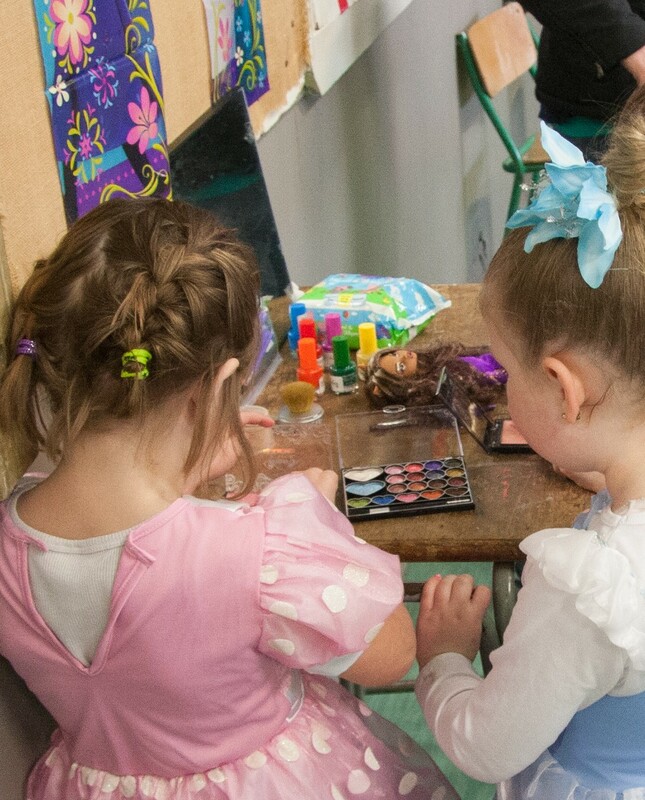 Princess’s Princess Extravaganza | Have kids, they said. It'll be fun, they said. My little Princess, my first baby, my little cutie pa-tootie, is now a big, grown-up five year old! It’s been a long week, with lots of sad endings and happy beginnings. Lots of tears (mostly from me, I won’t lie) and lots (read: TONS) of cake! We said goodbye to Kindy on Monday, which wasn’t too sad an event, since Princess is the youngest of her friends and therefore the last to “jump” into school, as they say. It amazed me the difference in her appearance between the first day at kindy (when she was not-quite-three) and the last day. She is taller, obviously, but her face has changed. I now see what she might look like as a teenager and grown up, and it’s a bit overwhelming! 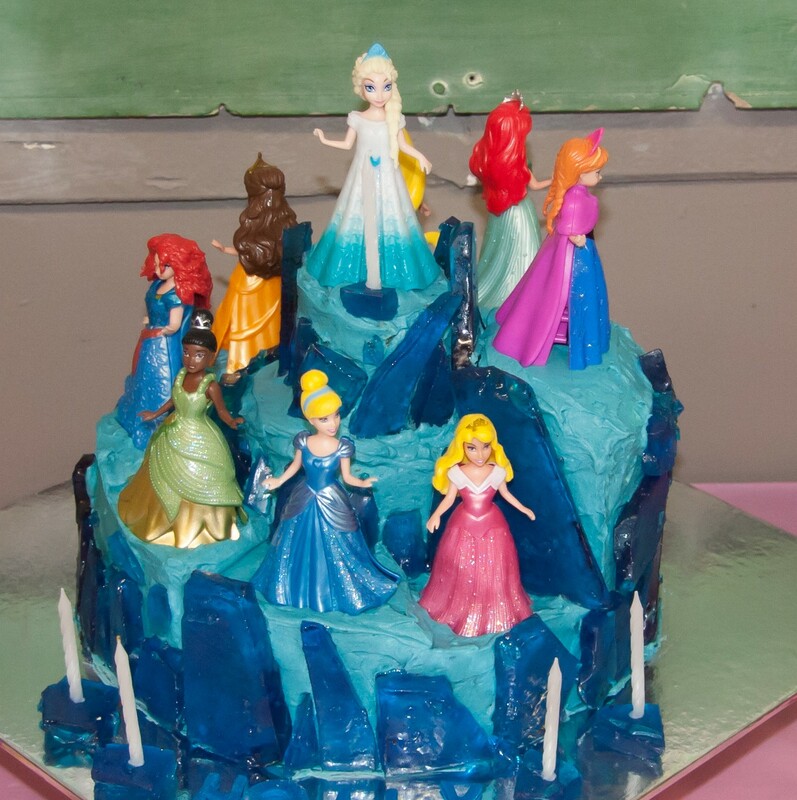 On Saturday, we had her birthday party – her Princess Extravaganza! 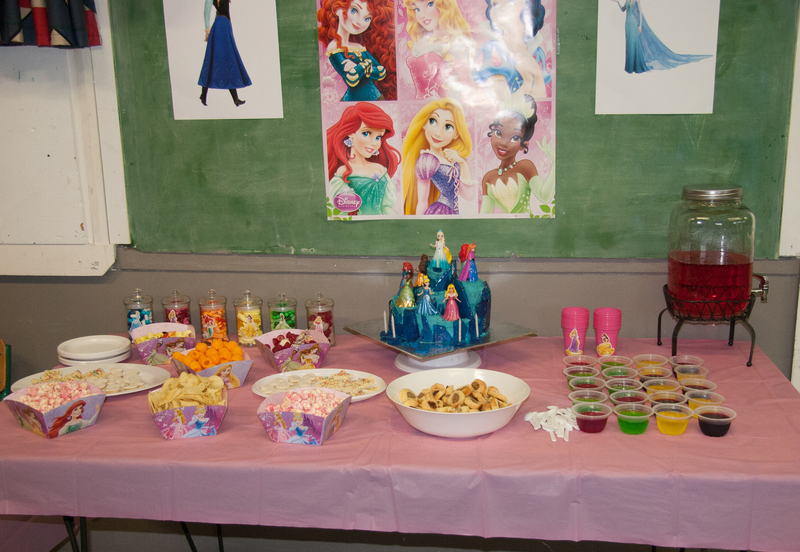 Princess loves the Disney Princesses (and, of course, the movie Frozen) so we planned her party around that general theme. It’s an amazingly easy theme to use, because there is so much available that fits well within the theme, without breaking the bank! The decorations for the party were very easy and not at all expensive. We had a central table with a cheap table cover on it. Behind the table I stuck to the wall a poster of the Princesses, and printed images of both Anna and Elsa from Frozen. Then we put balloons up to support the decorations. My intention was to make a “skirt” for the table out of crepe paper, but for some completely unknown reason, the crepe paper did NOT smell very nice at all when I opened the packaging, so I binned it! The tables were set with more cheap table covers, and then I placed paper Princess place mats at each setting (that I got from a local dollar store). 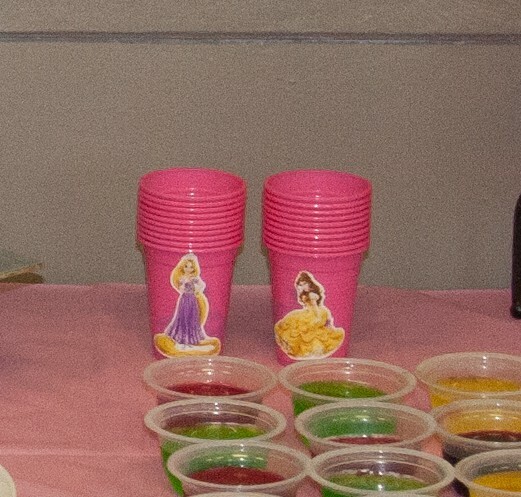 The cups were plain pink plastic cups that I added stickers to! They just ate off plain white disposable plates, I figured there was already enough colour in there. For the food display, I got cardboard disposable Princess bowls from the same dollar store as the place mats, and served food in them. The drink was in a great drink dispenser that I found really cheap at KMart. I was pretty excited to get it for $25, even more so when I saw it for sale in a homewares store for $89.99! An identical one! I ♥ bargains!!!! For the food, we let Princess choose her menu. She wanted: Pink Popcorn, Jelly, Cheezels, Peanut Butter Sandwiches, Fairy Bread and Sausage Rolls. For those unfamiliar with Fairy Bread, it is a New Zealand Kid’s Party institution! Basically, it’s white bread with margarine and sprinkles. A winner every time! I cut the fairy bread into star shapes and put it onto platters with “5” shaped peanut butter sandwiches. The jelly I made in four colours, and served in small plastic containers with little spoons. The sausage rolls were a hit, as usual – I cut them pretty small so the little kids could easily handle them. Princess really wanted Pink Popcorn so I searched and searched for food colouring spray but had little luck. So, I decided to attempt to make Pink Candy corn myself, and was pleasantly surprised at how easy it was. Boil the sugar and water together over a high heat until it reaches 238F (or, forms a medium ball in cold water). Grease the bowl that the popcorn is in (so the mixture doesn’t stick when added). Have the icing sugar ready, so you can move quickly once the sugar/water reaches it’s desired heat. Add the food colouring just before the syrup is heated properly. Quickly pour the syrup into the popcorn, stirring immediately (right to the bottom on the bowl) and add the icing sugar straight away. The aim is the syrup and the icing sugar stick to the popcorn together and harden, forming the nice candy coating. This is much easier done if you have someone to help you (ideally another grown up because it can get very hot). One can stir while the other adds the icing sugar etc! Leave it once coated and it will cool and harden and be just like the bought stuff! Of course, the cake. The Pièce de résistance of the party. Princess loves her Princess Magiclip dolls, so we had the idea to make Elsa’s staircase (from Frozen, of course!) and put all of her Magiclip dolls on the cake. She had no idea that we had the two Frozen Magiclip dolls, that was my special surprise for her on party day (and boy, was she surprised! “How did you know, MUM!! I love THEM!!!”). For the cake, it’s simply two chocolate cakes (round) stacked on top of each other, and (relatively painstakingly) we carved steps into the top cake. The top few steps are pieces of cake we took out of the lower steps! We iced it with simple blue-coloured buttercream, trying to keep the cake as dairy free as we could (so BabyGirl could eat some). To make the cake look more like an ice staircase, I made shards of blue “ice” – candy shattered to look like ice! Like the candy popcorn, this was much easier than I thought it would be! 1 Tbsp (clear coloured) flavouring/extract – I used strawberry essence because that’s what I had in my cupboard! In a medium bowl, stir together the sugar, corn syrup and water. Cook (while stirring) over a medium heat until the sugar dissolves, then bring to a boil. Without stirring, heat to 149-154C (300-310F), or until a small amount of syrup dropped into a cold glass of water forms hard, brittle threads. Remove from the heat and stir in the extract and the colouring, then pour into a greased, shallow pan or cookie sheet. Let it cool completely (resist the urge to poke it!) and then shatter it once it is completely cooled and solid, to resemble shattered ice. Note: don’t try to shatter it over the back of a plastic kids chair. The chair came out second best! No party is a party without some activities! Princess was adamant she didn’t want games with clear winners and losers, so we went for activities rather than games. We had a makeup table with some cheap eye shadow, blushers, foundation etc, and a mirror. We also had some nail polish. The kids loved it. They just went crazy, making themselves up, then making each other up! This was a real hit, the kids kept coming back to it throughout the party. We also had a table where kids could make their own “Princess Sofia Amulet” – a table with silver and purple stickers, purple card that I had pre-cut, and silver elastic that I also pre-cut. The kids designed, coloured and proudly wore their own amulets, I saw some kids wearing more than one! And, the best part of the party – the Princess! My amazing friend came all dressed up like Belle from Beauty and the Beast, and she was AMAZING. Fantastic! I can’t say enough how spectacular her performance was! 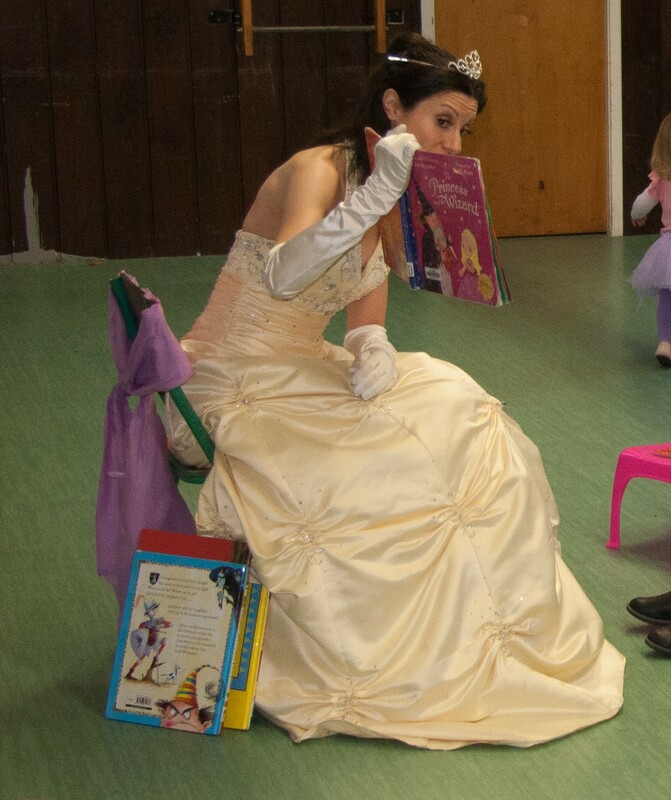 We hired the dress in the end, and she read to the kids, played, sang, told them stories about her friends, the other Princesses, and held court with the kids for over 45 minutes. She made the party what it was! All in all, this was an awesome party that I know my Princess enjoyed. Adored, even! “Mum! Belle knows my NAME” she whispered to me partway through the party! Ah, to be five again!